What’s impetigo and how can I get my very own? When you’re a kid, you hear about diseases like lumbago and gout and angina – and you have no idea what they are! Another of these is impetigo. I’ve heard of it, but, until it showed up on my children, had no idea what it was! 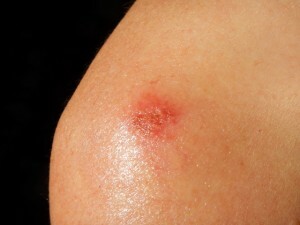 The short story is that impetigo is a common skin infection, picked up from bacteria in sand and soil. It’s caused by strains for Staphylococci and Streptococci bacteria and more commonly affects children – particularly ones like mine who play outside a lot and don’t like taking baths. It’s easily treated by antibiotic ointment, but there are resistant strains – that’s where MRSA skin infections come from. If left untreated, a course of oral antibiotics may be required. So that sounds pretty easy, right? But that’s in retrospect. At the beginning, I didn’t know what we were dealing with. It all started on an innocent Saturday morning. At breakfast, I happened to glance at my son’s knee, propped against the edge of the dining table in a manner that would not be considered polite by my mother. Erupting from his knee was a bulging and layered wound the size of an inflamed 2 pula coin. It oozed and dripped and appeared to be expanding before my eyes. I wish I’d taken a photo, but I was distracted at the time. “What is that?” I demanded, as a slight panic rose in my chest. “I dunno”, shrugged my son. This conversation was obviously not yielding the desired explanation. My son was remarkably unconcerned about the HUGE, bulging, gross, inflamed, nonhealing-wound looking thing on his knee. He helpfully pointed out that, actually, he had several such wounds, all over his knees, and a nice one brewing on his middle finger, which he delighted in showing me. We’ve been living in Africa for 4 months and every three weeks or so, there is a new health challenge. We’ve had diarrhea of course and vomiting. We’ve had dehydration induced headaches. We’ve had bloody stools that turned out to be not-bloody-stools, but rather poor water quality in the toilet. We’ve had high fever that sent us running for malaria tests (were negative). We’ve had horrible itchy rashes induced by stinging caterpillars. So giant oozing wounds out of nowhere seemed like a reasonable next step. All part of the experience. Despite my offspring’s lack of concern for the constant dribble of serum leaking from his knee, I obviously decided we needed medical attention and pronto. I considered my options, which are well developed, given all our previous health challenges. 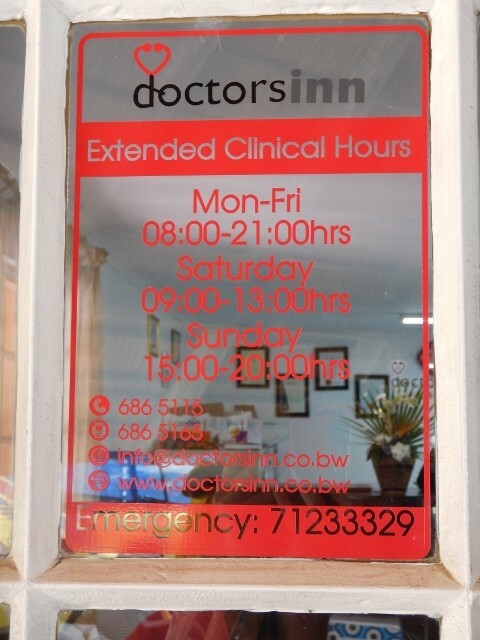 Even being a Saturday, Maun actually has excellent medical options. First, there is Dr. Max, who I met on the occasion of the bloody stools (don’t ask about that one). Dr. Max is wonderful. He is attentive, energetic, and knowledgeable. I liked him the moment I met him. He’s also highly recommended by several of my friends and has weekend hours – even on Sundays. His office, amusingly called Dr.’s Inn, is in the same thatched complex as the Indian restaurant Tandurei, near the airport. Incidentally, a straight-forward visit to Dr. Max, without bells and whistles, will cost you 200 pula, or about $20. Never have I had such competent health care for such a low price. The same visit in the United States would be $100, and that’s if you have insurance. Second, there are the pharmacies, which, in Botswana are called “chemists”. From repeated observations, I have found Maun pharmacists to be exceptionally good. They give solid medical advice and do their best to assist, even in disease diagnosis. The convenience of pharmacists is that you can see them quickly (no lines, no appointments) and pick up your meds, all in one visit. Also, you can get a greater variety of medications over the counter that you can in the U.S. Many antibiotics are available without a prescription. Although I like Dr. Max, I decided on this occasion to try the chemists first. I also looked online for likely explanations. Now, if you want to gross yourself out and give yourself a good scare, all in one day, you should go online and type in “skin infections”, sorted as images. You’ll find all sorts of interesting things you never knew you could contract. That said, I narrowed down the options, and decided that my son probably had impetigo, a diagnosis that was confirmed by the chemist, who gave us antibiotic ointment called Fucidin and he recommended that we wash the wounds 2-3 times a day with Savlon, a medicine-y smelling antiseptic soap that stains everything orange. Naturally when we got home, my younger son reported that he also had some nice spots of impetigo brewing. And so we began the 10 day assault on impetigo. It all worked out fine, though impetigo leaves scars that are fine on knees, but would not be nice on faces. The scars might fade. I learned at least two things. First, small infections are much faster to treat than larger ones (obvious), so bring antibiotic ointment with you when you visit Africa – so you are armed and ready. Second, I’m immensely grateful that the strain we had was curable with simple antibiotics. It makes me think about the development of antibiotic resistance in bacterial communities worldwide. I’m actually measuring antibiotic resistance in water bacteria in the Okavango. I’ve already found some, which I will report on when I get the data together.